Successful organizations understand the past and plan for the future. This page reports the strategic plans for AAUW and AAUW Pennsylvania. There are also ideas for branch strategic planning activities. 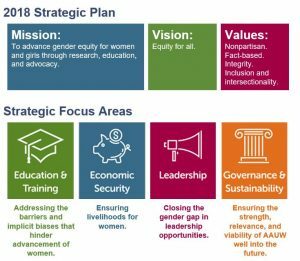 AAUW launched the new strategic plan — Beyond Aspirations: Advancing Equity for W omen and Girls — in August 2018. After a thorough process, engaging thousands of AAUW members from across the country, the Strategic Planning Task Force presented the plan to the AAUW Board of Directors where it received unanimous approval. Now, AAUW members must bring the plan to life. With the Mission, Vision, and Values as foundation, four Strategic Focus Areas were identified. Each focus area identifies audacious and exciting goals. The announcement email from Kim Churches, AAUW CEO, highlights a few. If you didn’t read the email or don’t remember, it is worth taking a minute to do so. Read the full strategic plan to learn about our future together. And, when you get to page 11, smile when you recognize a photo. Keep current on status at https://www.aauw.org/who-we-are/strategic-plan/. Mission: To advance gender equity for women and girls through research, education, and advocacy. Values: Non-partisan, fact-based, integrity, inclusion and intersectionality. AAUW Pennsylvania branch members, national members in Pennsylvania, college and university members, and student associates will work locally to achieve national goals. Together, AAUW Pennsylvania will be a welcoming and inclusive organization that serves as a significant resource and powerful advocate in Pennsylvania to move forward the four areas of the AAUW mission: Education and Training, Economic Security, Leadership, and Governance and Sustainability. Support and mentor branches and members across all demographics. Serve as a liaison between national AAUW, Pennsylvania branches, and individual members. Focus national and state goals for branches, providing ideas and resources to help branches of all sizes work toward those goals. Support and advocate for Pennsylvania legislation that empowers women. Provide leadership on important issues and help show their relevance at the state and local levels. A branch best practice is to have a strategic plan. Many branches launch a strategic planning process with every President term. This is typically a Board responsibility, however members should be informed and asked for input and to review prior to finalizing. Plans can’t be implemented if all persons with a stake in the outcome are not part of the process. A formal strategic planning process is provided at https://www.aauw.org/resource/how-to-create-a-strategic-plan/. Even if you don’t wish to implement this process, read this because it will give you ideas and offers many tips for success. A simple process is to start by asking questions. What do we want your branch to be known for in the community? Goals you have for your role/position? Items you would like a peer to set as a goal. Take each question one at a time. Ask each Board member to write down her/his ideas. Use various techniques to gather all input, making sure everyone’s voice is heard. Stop for discussion. Employ an anonymous voting technique to evaluate the list of goals. Consult with Ann Pehle, AAUW Pennsylvania (aauwpa.president@gmail.com) for ideas and assistance.